It has been reported the Spain international, who is no longer a regular under Jose Mourinho, missed training on Wednesday when the squad reported back to prepare for the weekend's FA Cup tie against Stoke on Sunday. United are said to be ready to launch what would be a club-record £37million bid for the 25-year-old midfielder, who wants to be playing in a World Cup year. While Mourinho has admitted the door would be open for Mata to leave, Chelsea are under no financial pressure to sell and it could take a transfer request for any deal to happen during the final two weeks of the January window. United are looking to kick-start what has so far been a stop-start Barclays Premier League campaign, which sees them down in seventh place, some 14 points adrift of leaders Arsenal following defeat at Chelsea on Sunday. The marquee signing of Mata would not only signal the intent of David Moyes, whose side will be out to reach the Capital One Cup final with victory over Sunderland on Wednesday night, but it would also not openly upset the balance of United's style, with the diminutive Spaniard able to offer something different in terms of transition through midfield. While Chelsea may well prefer to offload Mata abroad, seeing him move to Old Trafford would not necessarily impact on their own title bid as they have played United twice now, but with rivals Manchester City and Arsenal both still to face the Red Devils again, it could in the long run work in their favour to strengthen Moyes' options. 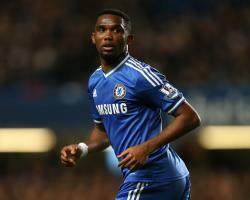 It was, meanwhile, Eto'o's hat-trick which helped sink United at Stamford Bridge. The Cameroon forward indicated to a Spanish radio station he would consider one day returning to La Liga at Mallorca, but for now the 32-year-old, who signed until the end of the season from Anzhi Makhachkala in August, could not be happier with how things are panning out at the Bridge. The former Barcelona and Inter Milan forward said on Chelsea's website: "At the moment we are still in practically all the competitions. If Chelsea are not the best club in the world then they are one of the best clubs in the world, so I don't know if we are going to win everything but the season is going well so far. "I like playing and when I get the chance to do that I have to help my team-mates. The Chelsea squad had been given Monday and Tuesday off this week, during which time Mourinho underwent surgery on his elbow on Monday in Paris which is hoped will cure a long-standing complaint. The Portuguese coach, who had been honoured by the Football Writers' Association at a gala dinner in London on Sunday evening, showed few ill effects of the keyhole operation as he put the Chelsea squad through their paces at Cobham earlier on Wednesday.